Very creative! Amazing! The skill involved in making this kind of art is incredible. November was a busy month working in Belgium creating “The Land of The Hobs” in beautiful Brugge. 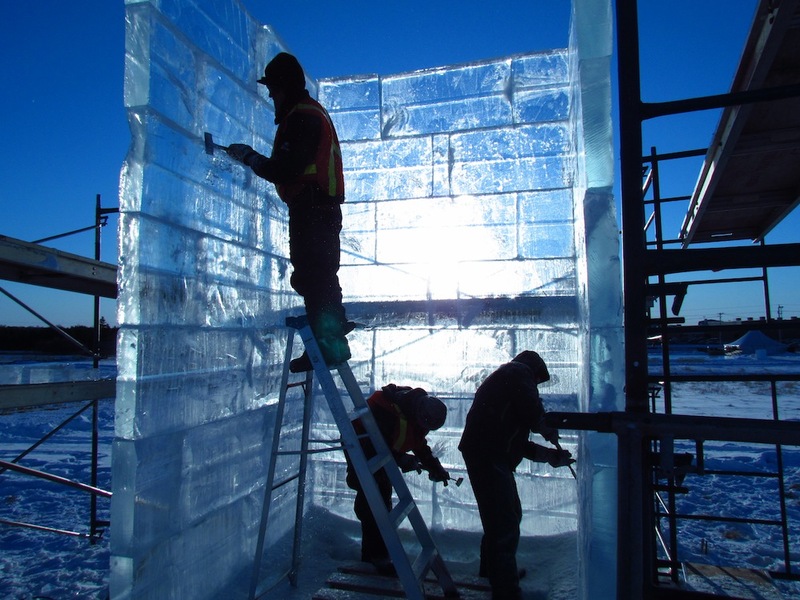 We had a chance to play with big crystal clear blocks of ice made locally. 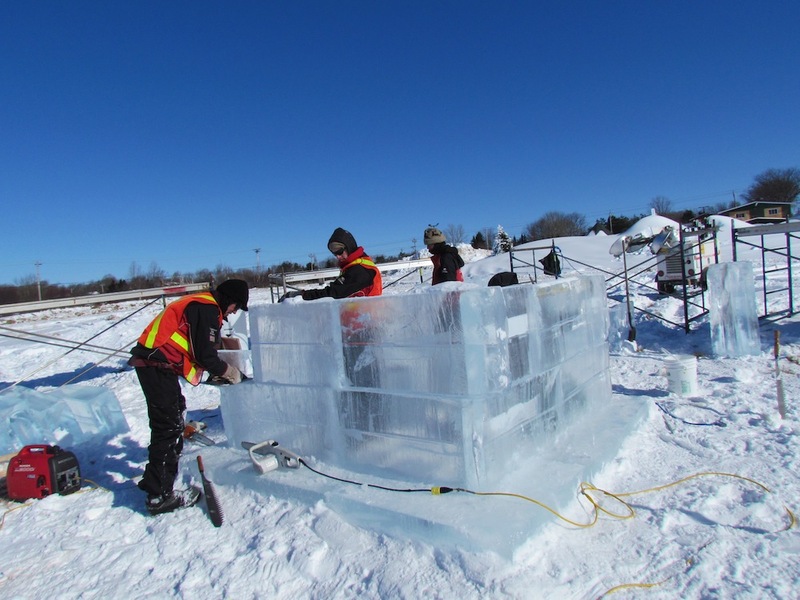 I really enjoy working on these big events, where the common efforts of over 20 sculptors come together in a span of 3 weeks to turn ice into a wonderland. This bed scene was sculpted by myself, Peter Vogelaar and Denis Klein. We had another great show in Taylor BC. This year the event invited Ilya Filimontsev from Russia, Susanne Russeler from the Netherlands and Dan Belcher from USA. They are all world class recognized sand sculptor, Dan winning multiple times at the world championship of sand sculpting. I ended up sculpting a weather worn cowboy catching a bull. This sand is so strong I was able to open the tail and get the horns to stick out, we just had to let the sand dry a bit so it got strong enough. in Sand Sculpture. Bookmark the permalink. April was a busy month, just after Japan I got a chance to go to Taiwan to take part of a great event organized by JOO Heng, a sculptor from Singapore. We were asked to make some Zodiac signs, I picked Leo and Pisces. For the competition I wanted to explore paper fold and human figure…which I think has great visual potential.I didn’t really manage to create what I had in mind. I wanted an old couple being wrapped in the fold of their life story. I feel there is a better way to represent that image than the way I did it. 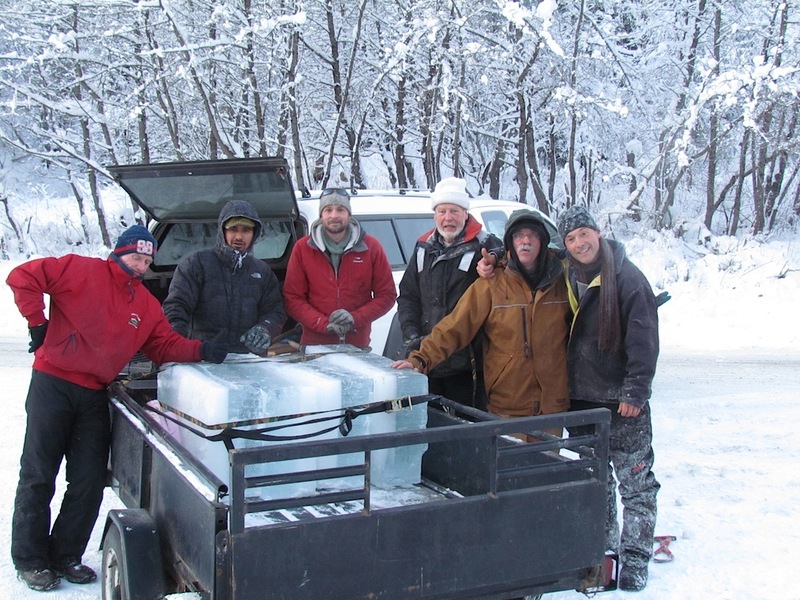 For the past 6 years we have been going up on small Fish Lake above New-Denver to harvest ice for a great German style event called Christmas by the Lake. We usually hope for 6 to 9 inches thickness. 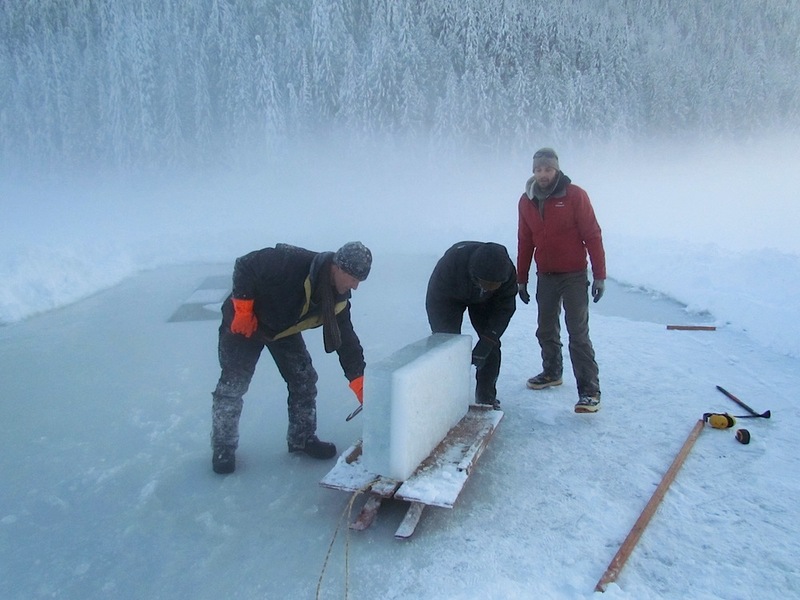 Its a bit early in the season but the best time to harvest is before there is snow on the ice, as the weight pushes the ice down and water comes back on top and its a big mess. 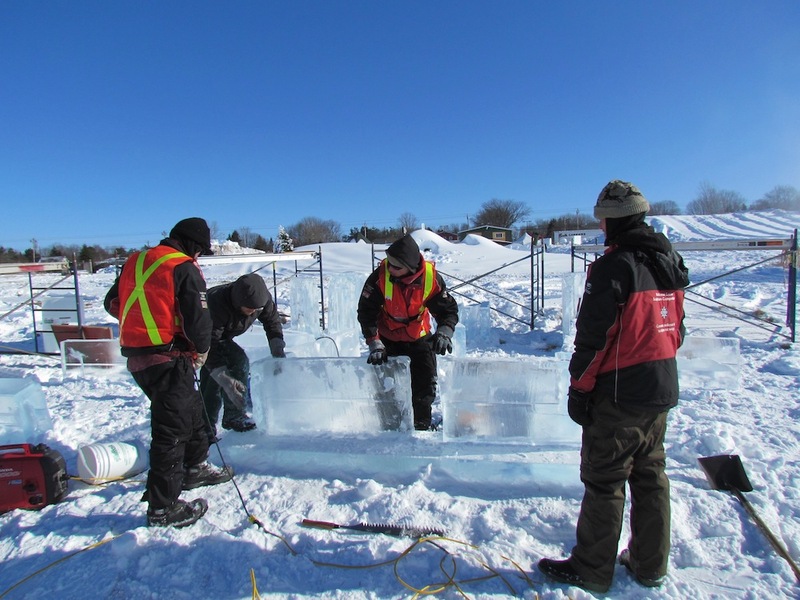 This year was a great cold sunny day and the ice is fantastic. It makes for a great workout and good times with friends.The fellow beside me in the group photo is Armand Lange..vibrant organizer. 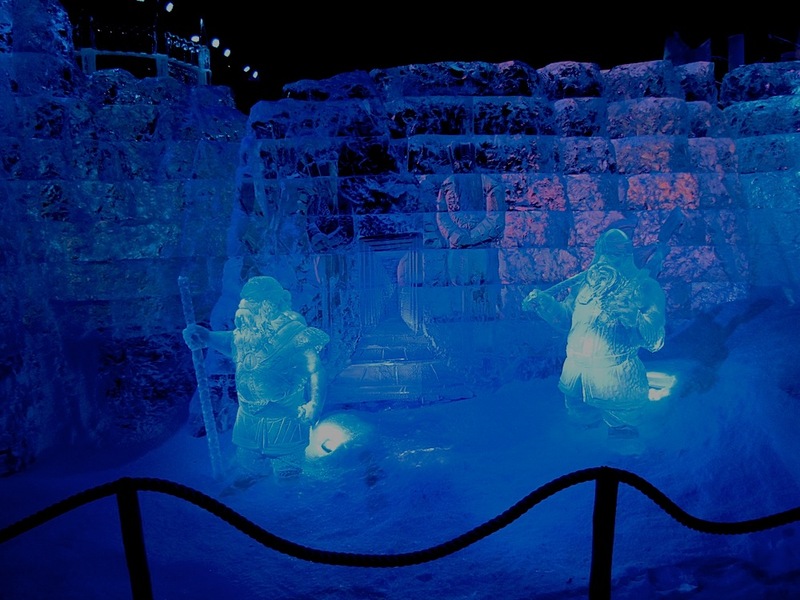 in Snow and Ice Sculpture. Bookmark the permalink. 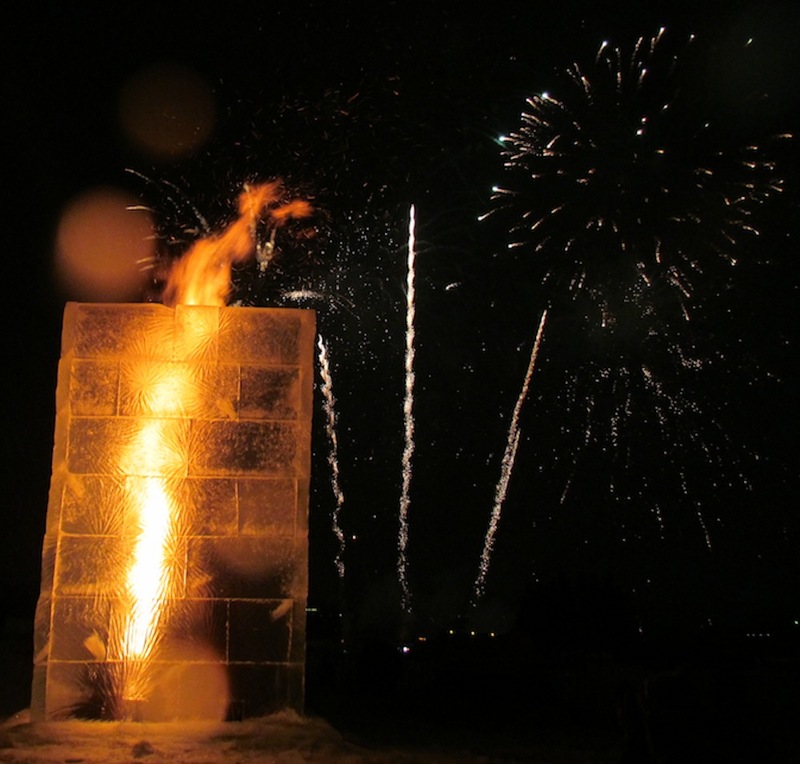 I had a great opportunity to take part in an international sand sculpting competition in St-Petersburg Russia in July. 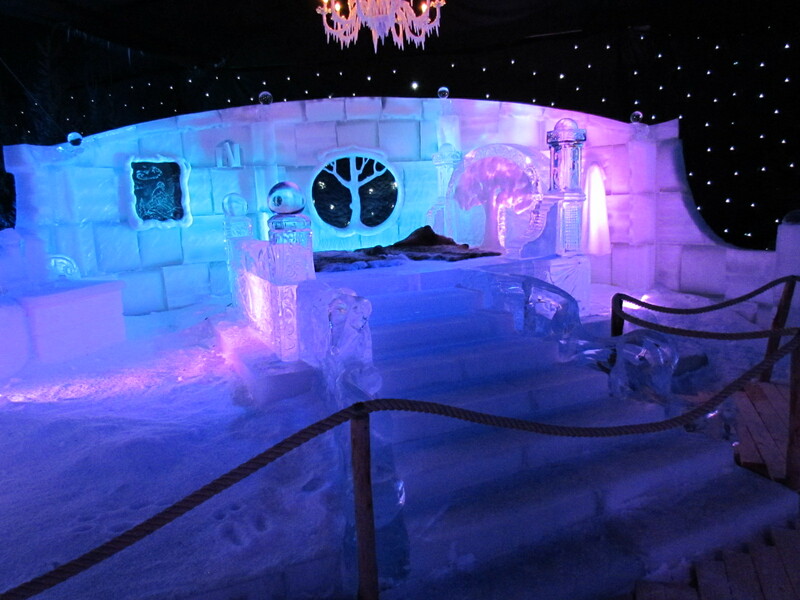 The theme was Fairy Tales, and I chose Thumb Tom, which gave the chance to carve a big scale figure. The sand was rich in clay and strong. The setting was fantastic, within the old fortress facing the Hermitage, which I got to visit. I was happy to get invited by Rich Varano and the Sultans of Sand to participate in the 2012 sand event in Jesolo, north-east of Venice. I apologize to my European friends but I was kind of glad to hear that it was not the European Championship this year. We decided to make it a family trip, so Chris (my wife) and Hazel our youngest daughter got a chance to travel to Rome, Florence and Venice and also played in the sand at the event. My theme was the plague. I ended up spending a bit too much time on the architecture part of the piece, putting me behind by a day (self created mini drama). I was glad to have Chris working on the mist-fog around the plague victims. I hear they will set up a real fog machine for added drama. I look forward to see that. 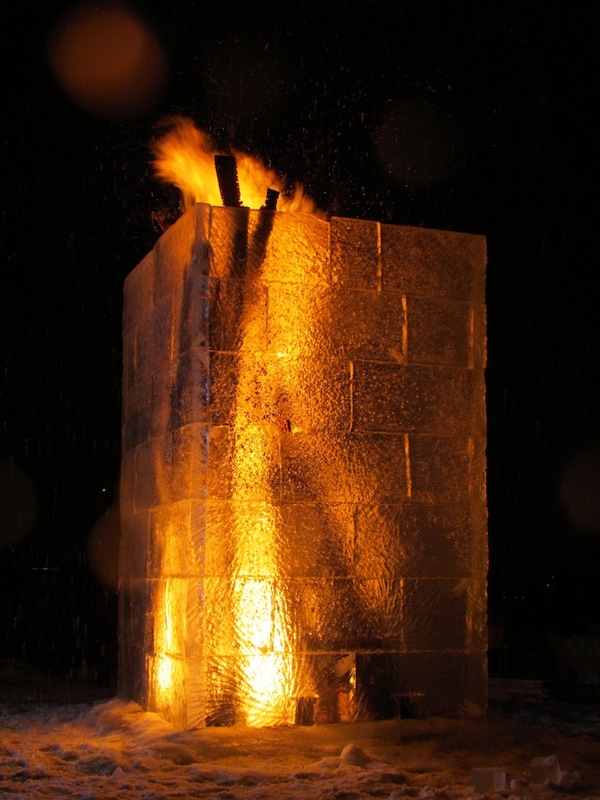 The Ephemeral Arts Team, David Ducharme, Peter Vogelaar, Carl Schlichting, Delayne Corbett, Stephane Robert, Abe and Ben Waterman had the chance on their last JackFrost adventures to build an ice firetower. 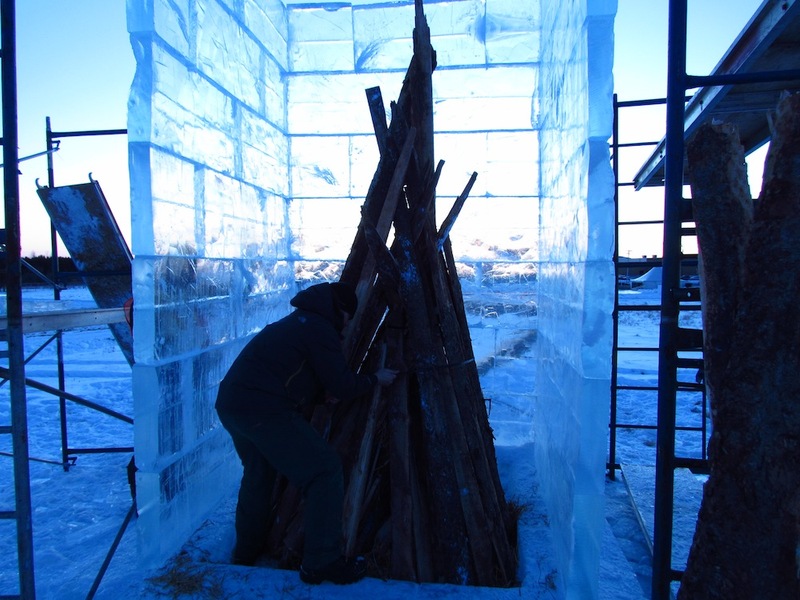 The whole purpose of this undertaking is to burn it down, having the fire and ice dancing together, creating an amazing treat for the eyes. 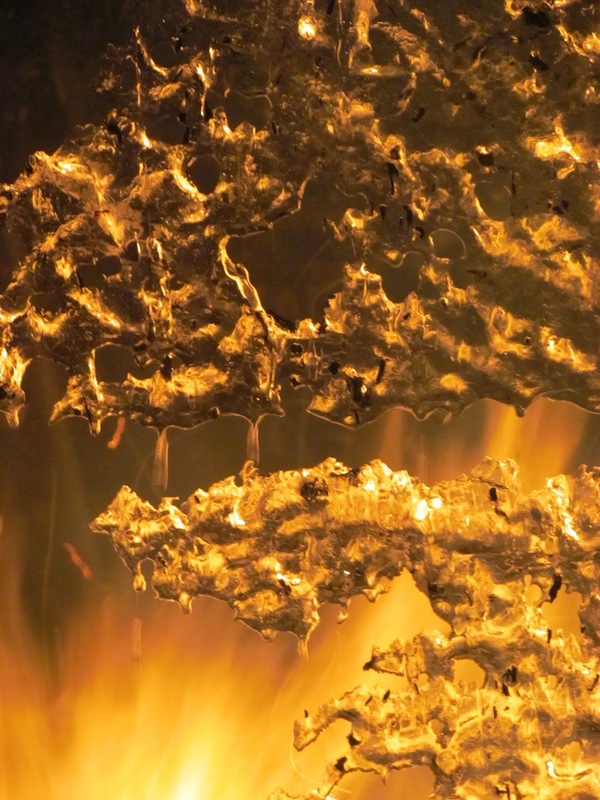 The fire ended up falling on one wall of the tower after 20min or so. 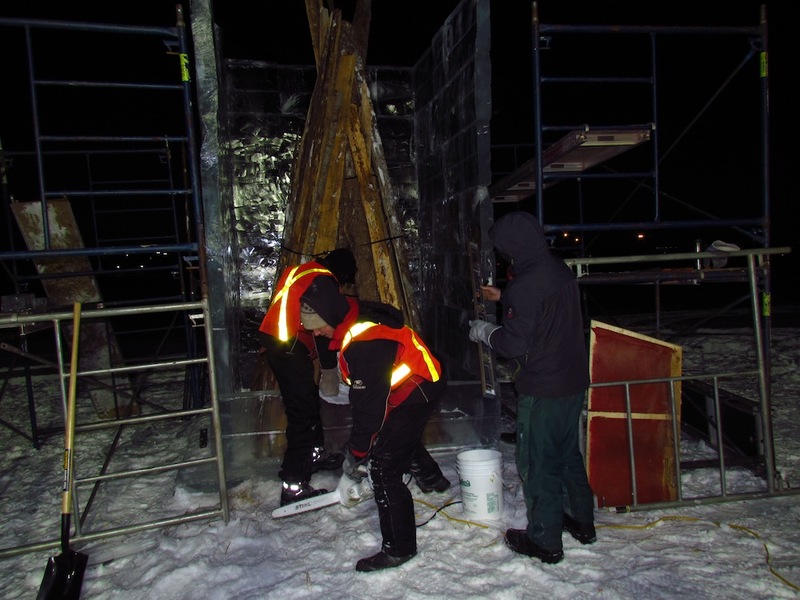 We think that next time we would wire the top of the stack down to the 4 bottom corner of the tower to stabilize it. 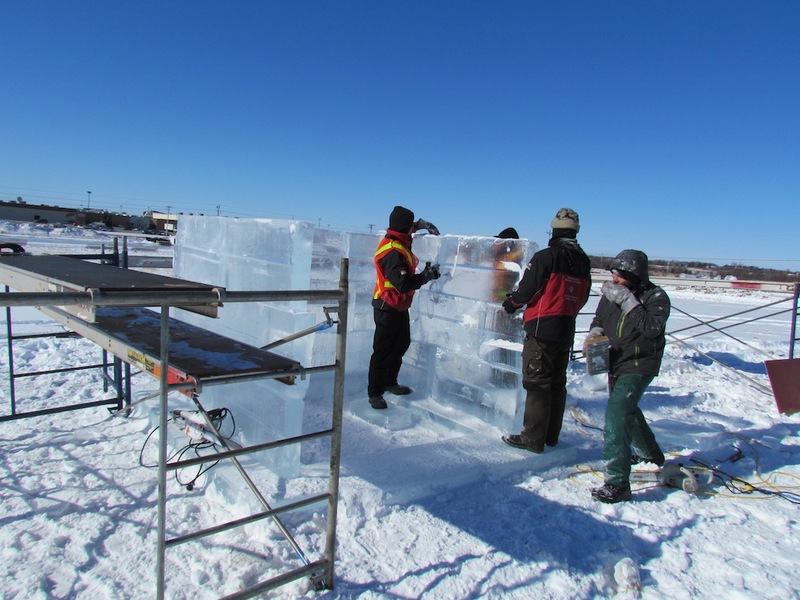 I was honoured at this year’s High on Ice Festival in Fort-St-John, BC. 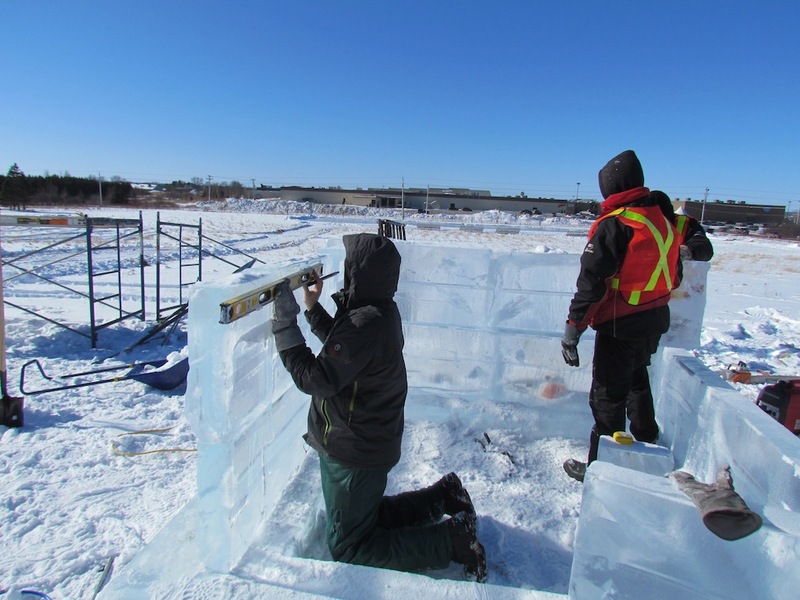 with the privilege of designing and sculpting a First Nation piece. I didn’t know anything about who the local band was and any of their history. So I started to read about the Dane-Zaa people and learned a few things about their ways. As I read, one thing captured my attention right away…THE DREAMERS. 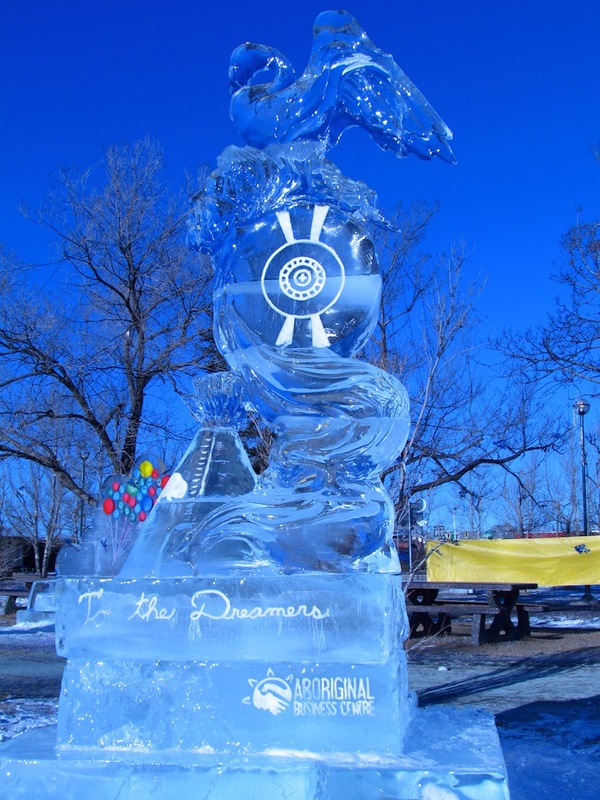 Naache (Dreamers) are the Dane-zaa people who travel to Heaven in their dreams and bring back songs. The songs provide teachings, visions, and prophecies from the creator. The Dreamers share these songs with our people to guide us through our life on earth. Most of our dreamers gained their abilities only after dying and coming back to life; like the swans, Dreamers can fly to heaven and return to earth. So the general idea with the piece was a tipi at the bottom with a beaver engraved on it as it is the symbol of the Dane-zaa people. The smoke is the dream with the drum and the dreamer, connecting to heaven with the swan. Thanks to Pat Jansen who is the District Vice-Principal of the Aboriginal Education Centre in Fort St-john. She filled my everlasting ignorance about the world and some of it’s people. I have been having fun in the past few years sculpting pumpkins. 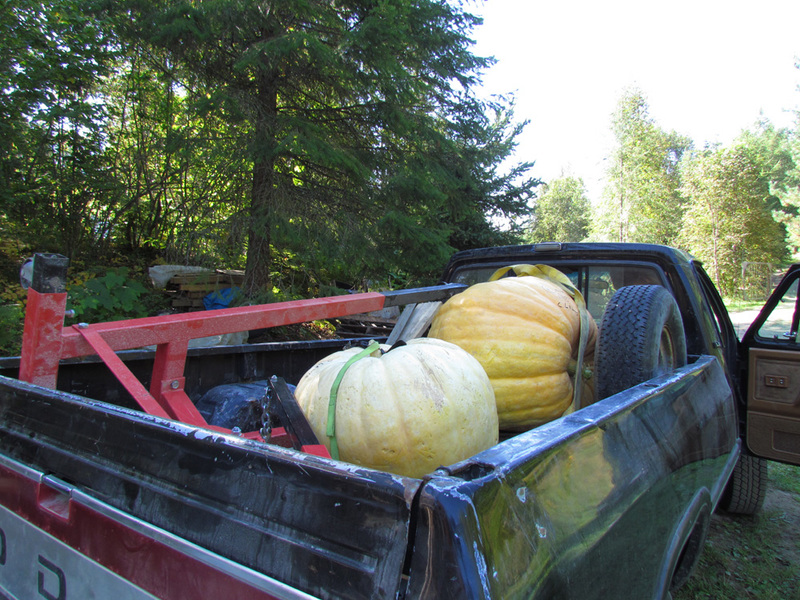 The Winlaw Fall Fair in September was a great opportunity to get my hands on a big pumpkin. Mr.Lewis, a local farmer, grew the 362-lb. pumpkin and told me that with the right genetics and good watering they can grow up to 30 lbs a day, wow…. I have had to move a lot of heavy things over the years and now I really try to save my back as I am feeling it more and more. I used a hydraulic hoist, some slings, some steel pipes as rollers, and plywood to move the pumpkin around. I will now make sure it gets carved before long as I noticed some mold starting on the side it grew on. I carved a smaller pumpkin for the fair and played around with some Chinese-style vegetable art I had seen in a book.. That was a lot of fun. My pumpkin mentor is Ray Villafane, an incredible pumpkin carver and sculptor all around. 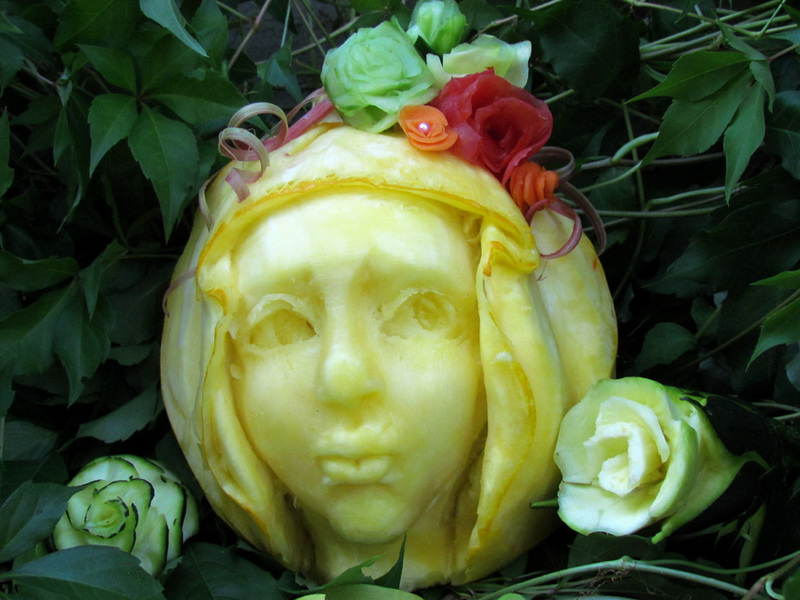 in Pumpkin Sculpture. Bookmark the permalink. 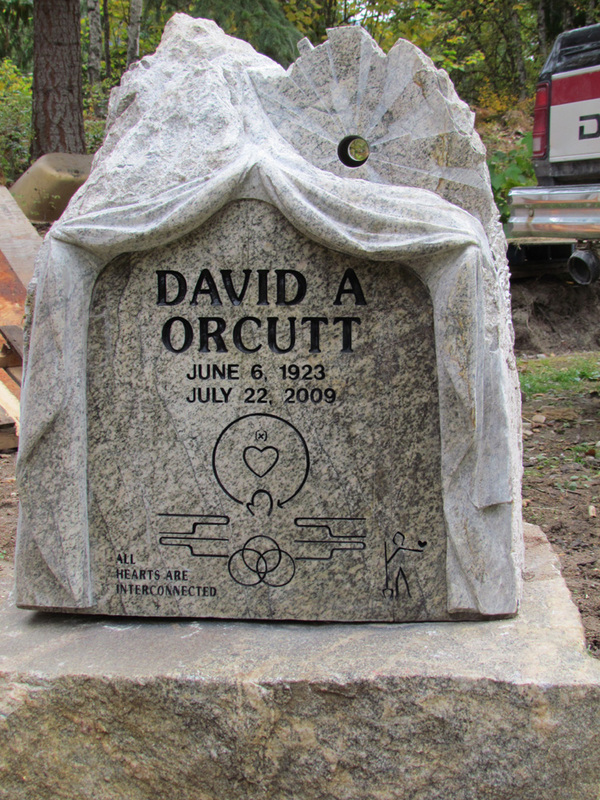 I have been given the honour to sculpt a memorial for a dear friend named David Orcutt. He was born in 1923 and moved in the Slocan Valley in the early 70’s. He owned over 150 acres that have sheltered many of us over the years. It took me a while to get a sense of how to commemorate and remember him through an art piece. 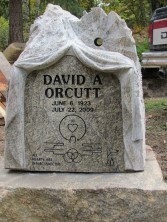 I decided to choose a stone from his property; it is granite, about 36″ tall by 30″wide. I have in mind a curtain opening the mountain scape, representing his love of puppetry, theatre and connection to the land. I will sandblast the lettering and the sun rays. I have this idea to incorporate a kaleidoscope where the sun sits on the memorial, representing a bit the way David saw the world. It is still in progress- I have to find or make a base and should get the sandblasting done at a master sculptor friend John McKinnon’s in Nelson. I was a bit impulsive when I started and wasn’t wearing a dust mask…..bad idea, that gave me a sore throat for a couple of weeks. I will post some more when I place the memorial at his grave. I finally did the kaleidoscope that will fit in the 1 1/2″ hole.. I took appart an old lense and was happy with the results until I noticed that I haven’t scealed the eye hole with clear glass. in Stone Sculpture. Bookmark the permalink.